Cigars On The Porch: Heeeeeere's HOMER! 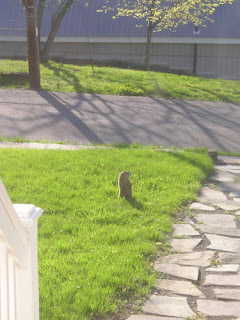 Yes, Ladies and Gentlemen - Homer, our resident groundhog / woodchuck / marmot is back in full force and munching on weeds and maple saplings like there's no tomorrow. 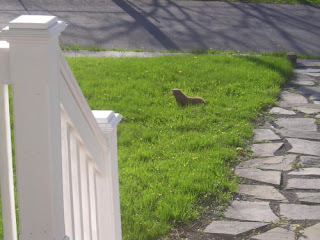 And that can only mean...IT'S FINALLY SPRING!!!!! Many warm, happy spring days to you folks (and for you FL friends - I hope your late spring/early summer stops being so damn hot and smoky). D'ohh! Sure hope Homer is around in a couple of weeks - I'd like to meet him myself, or at least get a picture of him! Have a great weekend.